At Harker’s middle school, our comprehensive academic program prepares your child to excel in high school, college and beyond. We know that middle school is an incredibly important time in your child’s academic, social and emotional growth. That’s why we designed a curriculum that meets our students’ academic needs and encourages them to explore their passions at school and in their daily lives. 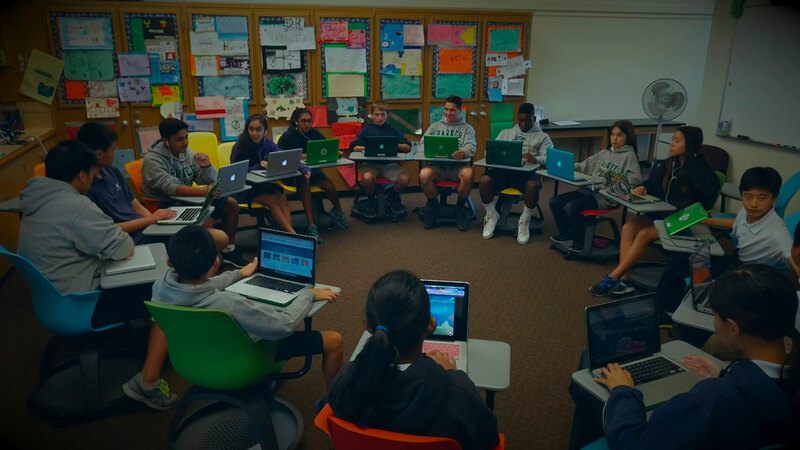 At Harker’s middle school, our goal is to create powerful learning opportunities both in the classroom and through a vast array of extracurricular activities. Our comprehensive approach combines an integrated curriculum and creative teaching techniques with rich, extracurricular activities. learn deeply in rich, academic subjects. Our curriculum emphasizes deep learning experiences through classroom discussions, extended science labs, problem-solving opportunities, daily foreign language lessons and global learning experiences. With our 1:1 laptop program (one laptop for every student), technology integration in the classroom and extensive library resources, your child will experience an intellectually rich academic environment at Harker. With placement tailored for each student’s success, we support your child’s academic abilities and interests at any level. Working with advisors, academic counselors and team of teachers, students receive guidance and support as they move through their coursework here at Harker. We enrich our academic core requirements with wide-ranging electives from math contests and study skills to drama and jazz band. Beyond our academic core classes, we offer our students even more opportunities to explore their interests and broaden their horizons. Educational field trips to locations such as the national parks, including Yosemite, and Washington, D.C.
Our teaching team comprises people who are passionate about their subject areas and dedicated to working with this dynamic age group. All of our teachers hold bachelor’s degrees and many have advanced degrees, and they are always enriching their skill sets with ongoing professional development. Outside of the classroom, teachers are mentors, role models, club leaders and our students’ biggest fans – cheering them on at sports games, checking out their latest art installation and giving them high fives for jobs well done. We infuse our curriculum with global learning experiences, such as our annual trip to our sister school in Shanghai, that empower students to engage in the world beyond the campus and their community. In collaboration with our sister schools across the world, we encourage students to learn about other cultures through a variety of opportunities. We teach character development skills as a part of the regular curriculum, engaging our students to develop essential character traits including kindness, respect and integrity. During the year, students demonstrate our values of character, service, knowledge and excellence while promoting school spirit. With this approach, our middle school campus is an inclusive and supportive learning environment. Beyond the classroom, our students perform service in the community with fundraising efforts, charity drives and volunteer work. Behind every student at Harker’s middle school is a dedicated team of teachers, counselors and advisors to support, motivate and celebrate along the journey. Our support teams work together to monitor our students’ academic, social and emotional growth and development.